Some time -and some more coding- have passed after this initial teaser from Craig. Using his code calling Amazon Alexa as a foundation, I could trigger some more business into my HANA instances from my Google Home. When I entered the “Create a monthly purchase order” in the “User says” field, it automatically detected my entity and added it in the definition. This will allow me to use the same phrase once and pass the order type as a parameter. I could also do this with the material number and the supplier name or ID, for example. //Call async function to create Purchase Orders. It will set the value of "data" with the speech for the assistant. Whoa! Too much? What’s happening here is that during the demo we were actually calling two different hosts, one was representing our main Manufacturing system on SAP Cloud Platform and the others were HXE hosts representing our suppliers. Those hosts were actually HANA Express instances in each of our different hosting partners (MS Azure, Google Cloud Platform, Amazon Web Services or an Intel NUC). We had a different command to change the supplier as well as a definition of what the different types of purchase orders were (the MRP would define that in real life instead of hard-coding, but you get the idea). We are calling two types of services to update or insert new records into our tables, an xsjs script and an xsodata that calls a procedure.There is plenty of documentation on how to do this, so I will not go deep into details. The code snippets above are adapted samples we used in a demo. 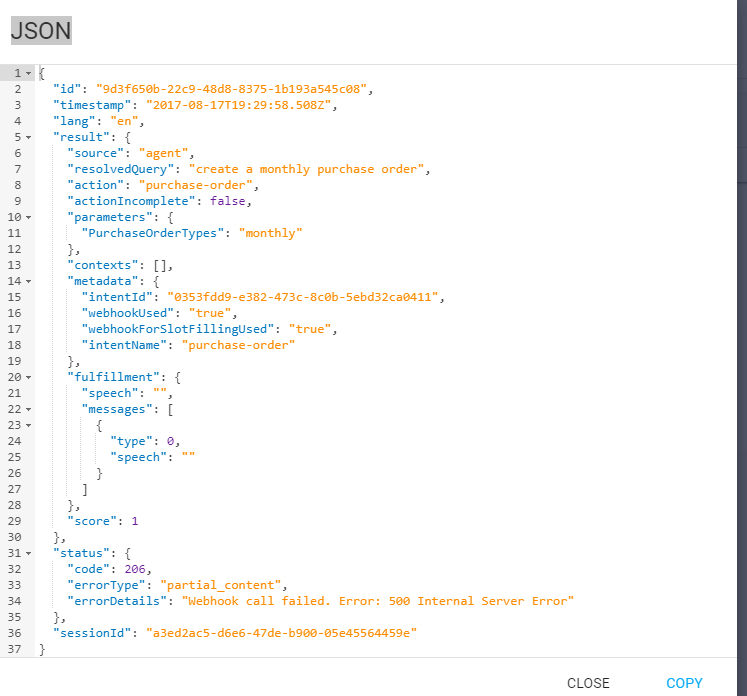 The steps to create an anonymous connection are in this tutorial or in the last part of this blog which also explains how to create a project using HANA Studio in case you are just getting started with SAP HANA. Happy talking to your HANA instances and see you on Twitter or on LinkedIn ! Awesome this is the Future. You guys took this to a different level. Artificial Intelligence is really taking our tedious activities in ease. But I doubt about the security, how secure it would be share access with any digital assistant. Do you think that sharing access with digital assistance may put our data at risk? Thanks, Niranjan! I don’t think this poses any different risk than sharing access with the normal user, but it would depend on what kind of access the assistant has. I would be as worried as with any other interface as in this case the intelligent part is in the speech recognition, but the actions it can perform in the system are limited to the services I enable. Amazing blog to study and impmentaion, thanks for sharing. Thanks, Shivam! Would love to hear about your implementation use case. Cheers! 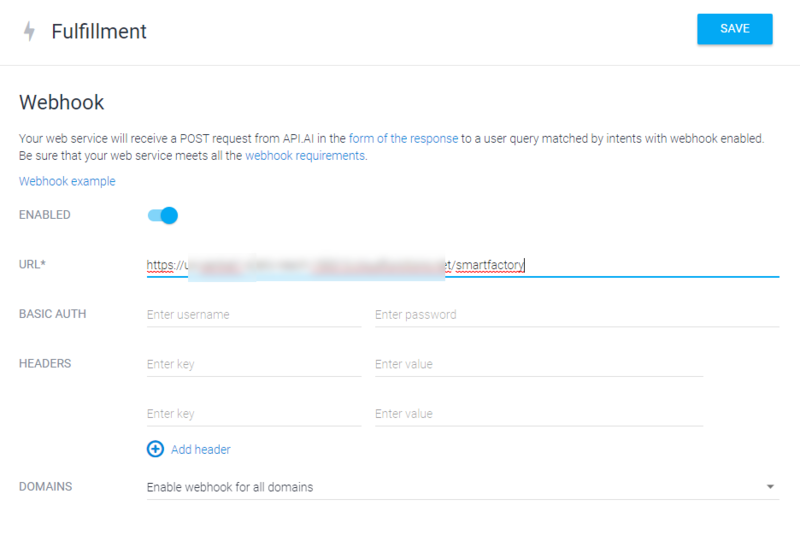 I am getting below error message while trying to trigger the Webhook service from the intent api.ai. Hi, Jeet, what does the Cloud functions logs say? Getting the below error. 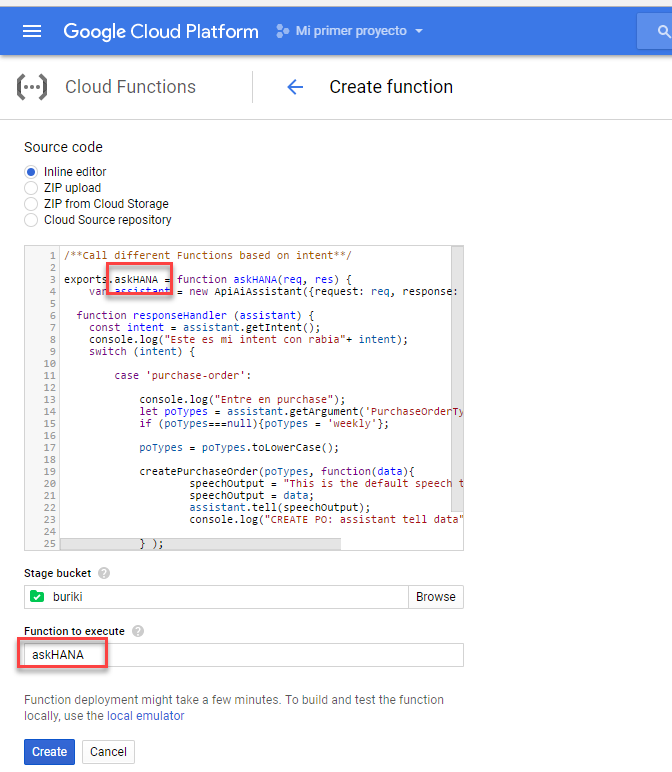 Am i missing a step is cloud function? Looks like you are missing some code. For example, the declaration of ApiAiAssistant. This is probably not the only thing I did not copy from my original code. You may also want to check Google’s and APi.AIs documentation as some things have been updated since I wrote this blog. Another piece of advice is to test locally with the SDK, at least at the beginning. It saves time in the long run as the Cloud Functions are not quick to update. Thanks Lucia. It’s working now. I wanted to consult you, as they solved the issue of authentication by saml, since I have a similar scenario, where I can only access services in SCP, with basic authentication. I am not sure what issue you are talking about. This question will probably get an answer in the Q&A. Can you help me with the connections of SAP HANA (Cloud Platform) with GCP ? And one more thing, I would like to ask is that, where to paste the createPurchaseOrder function ? is it inside the same file, which has the first snippet ? The createPurchaseOrder function is called belongs with the rest of the code in the cloud functions snippet. If you look at the code, you will see it is getting called there. Can you please share or let me know the type of tt_PurchaseOrders in Xsodata service . Unfortunately, I do not have that code handy but it is surely a table (an entity in CDS). It had an item number, material number, quantity and vendor as far as I can remember. Function load error: Code in file index.js can’t be loaded. Did you list all required modules in the package.json dependencies? this i am getting whenever i am deploying the cloud function as you suggested above , I am trying hard to overcome with the help of some npm installation but still no luck. It is very nice and informative blog!! I would like to know whether this can be initiated through Google Assistant right from Android phone as well OR it has to be done from Google Home type devices ONLY? If it can be done through google assistant, how the integration comes into the play? The integration in Dialogflow (former API.AI) says it works with Google Assistant in general, so I don’t see why it would not work with an Android phone. Thanks for this blog, i am very interested to know about SAP using API.AI google. Is it possible to do like this using SAP MSSQL platform or this is only applicable for SAP HANA platform? There is no platform called “SAP MSSQL” , can you expand what you mean? The code above uses xsjs, which is one of the server side options for HANA. If you’re not using HANA, you can surely write a similar integration for another programming language running somewhere else. What i mean for that is MSSQL back-end also. The other method that i am looking for this MSSQL back-end is the B1 integration framework. I know you are using the SAP HANA Service Layer to integrate the google home assistant.